Military personnel are disproportionately affected, so the U.S. Department of Defense created an institute to learn more about TBI. Since ancient times, the dilemma of correlating symptoms with causes has bedeviled medical practitioners. In many ways, this challenge has come to define what many have called the signature wound of the Iraq and Afghanistan wars: traumatic brain injury (TBI). Because of the widespread use of improvised explosive devices and other highly concussive weapons, military personnel have been disproportionately affected by TBI during the past decade. Although most patients with mild TBI will have symptoms that resolve within six months, the often-overlooked truth is that some suffer much longer. Because TBI occurs inside the body, medical imaging has been invaluable for detecting and diagnosing severe and moderate cases, but mild TBI has proven to be much trickier to pin down. Patients may present with a range of symptoms, including memory or concentration problems, headaches, nausea, fatigue, mood swings, depression, and sensitivity to light or sound, but standard structural imaging doesn’t reveal brain abnormalities in this population. This can be incredibly frustrating for patients who don’t exhibit signs of TBI on objective measures but continue to struggle with symptoms. The U.S. Department of Defense created the NICoE to help service members with persistent symptoms of mild TBI. If mild TBI symptoms fail to resolve within six months, the NICoE offers an opportunity for a second, comprehensive evaluation. Patterned after the all-inclusive treatment environment of the Mayo Clinic, the NICoE uses highly sophisticated imaging, neurocognitive testing, and novel therapy modalities to advance treatment, research, and education related to TBI. Fewer than 500 patients are seen each year, but the NICoE provides each one a wide array of testing and treatment in an outpatient setting, totaling approximately 90 hours of care in a three-week span. Equally important, each patient receives a highly detailed treatment plan to follow after leaving the center. One difficulty with mild TBI is that there aren’t objective measures to identify it. Currently, TBI is diagnosed using the Glasgow Coma Scale, which is based on symptoms, such as whether a patient loses consciousness and for how long. In moderate and severe cases, CT or MR will often provide an attendant finding that confirms the diagnosis, but a patient with mild TBI may have five normal MRIs in their medical record and still be exhibiting symptoms. Eighty percent of TBI cases among service members are classified as mild. Riedy seeks to develop an objective measure for TBI. To do that, he and his colleagues use sophisticated imaging techniques to mine for subtle physical clues that can be tied to symptoms. One technique that has shown promise is thin-slice MR imaging. Rather than the typical 5-mm slices of a typical MR scan, Riedy uses 1 mm isotropic voxels to produce highly detailed images of the brain. The scans reveal small, nonspecific T2 hyperintensities in the white matter of the brain. The researchers aren’t certain but suspect the location of the hyperintensities and the age of the patients could be significant. Another technique that has proven useful is susceptibility weighted imaging, an MRI technique that uses a gradient echo sequence to detect changes in the magnetic field. Riedy’s team has developed a pulse sequence that is finely attuned to the brain’s vasculature, and they use the sequence to look for signs of microbleeds. More specifically, they’re looking for hemosiderin deposits that are left behind after a hemorrhage is broken down by the body. The iron molecules in hemosiderin act like tiny bar magnets, disrupting the magnetic field and producing what’s called a blooming artifact, a grouping of tiny black dots that appear larger on the image than they actually are. Rather than attempt to eliminate the artifact, the researchers enhance it to look for areas of potential damage. While signs of microhemorrhage don’t directly correlate with TBI, they may prove to be an important piece of the puzzle. In an attempt to find a disconnection of the neural pathways involved in higher order thinking, NICoE doctors use functional MRI (fMRI) to see which areas of patients’ brains are active while performing memory tasks. Riedy says he has seen changes in patients’ cerebellums, which is atypical in healthy subjects. He says some blast models indicate that blast waves may concentrate in the posterior cranial fossa, where the cerebellum sits. While all of these findings are adding to the body of knowledge about TBI, the NICoE’s researchers are still looking for new ways to evaluate the condition. Riedy says he plans to do a biofeedback study with fMRI, with the goal to train patients to control their response to anger while undergoing the exam, which would provide a real-time snapshot of how their brains respond to stressful stimuli. Diffusion tensor imaging (DTI) measures the diffusion of water in body tissue and is currently used with group analysis—warping brain scans into a standard space to detect changes—but Riedy doesn’t think that method lends itself to studying TBI. Since each individual’s trauma is unique, he does not believe attempting to average out differences provides an accurate snapshot of an injury. However, he does think DTI may have future potential for studying axons in the brain’s white matter. 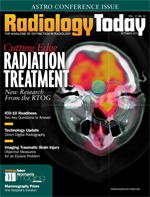 PET/CT may also be helpful, eventually, but Riedy says new PET analogs are needed. He cites PIB as a potentially beneficial compound because it binds to beta-amyloid proteins in the brain. He notes that there are some indications in the medical literature, based on studies of boxers and others, that beta-amyloids are a positive indicator for trauma. Riedy is also interested in tau analogs, proteins that have been found postautopsy in the brains of some NFL players. Perhaps the most exciting future modality, and a near-future one at that, is magnetoencephalography (MEG). A functional exam that records the magnetic fields caused by electrical activity in the brain, MEG can directly view the axonal firings in the brain, in real time, which will be tremendously helpful in determining whether there is damage to the neural pathways. The VA hospital in San Diego has already had some success correlating MEG images with TBI. The NICoE has a protocol that fuses MEG and fMRI, but they are waiting for permission to begin using it. By fusing the two scans, the researchers will be able to see the vascular response with the fMRI in conjunction with MEG’s electrical response. While fMRI takes several seconds to make a single pass, MEG takes tenths of a millisecond. Riedy hopes to start using the MEG/fMRI protocol early in the fall. “They’ll get the same pass in the fMRI study, then they’ll get the same pass done in the MEG, so we’ll have very good correlation between the two, just on different time scales, but you’ll have some very different looks at what’s going on in the brain,” says Riedy. What types of treatment are indicated by all of these studies is still very much an open question. The hope is that by identifying certain patterns of brain injury, patients may be assigned to treatment groups that address problems associated with their particular type of injury. For example, if there is a cluster of patients experiencing executive function-type problems, such as difficulty finding items at the grocery store, they may be assigned to a treatment group that teaches strategies for dealing with those problems. Objective measures would greatly aid the process because there are some overlapping symptoms between TBI and posttraumatic stress disorder (PTSD), and the two conditions require different types of treatment. Riedy says PTSD is even more challenging to identify than TBI. However, by taking a methodical approach, he is confident that progress will be made. Although the NICoE began operation in October 2010, reaching a critical mass for this type of research endeavor has taken years. All of the data analysis that’s required with this technology requires significant manpower. Riedy began this work at Walter Reed Army Medical Center as a lone researcher and, by persistently applying for government grants, was able to build a neuroimaging team. The team has grown to 18 people, 10 of whom are dedicated to image processing. — David Yeager is a freelance writer and editor based in Royersford, Pa. He is a frequent contributor to Radiology Today.